In the Central African Republic is a large influx of refugees arrived. It is the result of the advance of rebels in the country rapidly brings under their authority. The regime of President François Bozizé seems unable to do something back. The rebel group Seleka is now at the gates of the capital, Bangui. Hundreds of thousands of people are fleeing. The U.S. and the UN pulling their people back from the land. Several rebel movements in the Central African Republic have a couple of weeks ago, united under the name Seleka, which means Alliance. Since then, the regime of President Bozizé authority over large parts of the country lost. "That we have not yet taken Bangui, is a matter of courtesy," said the rebels. Shortly afterwards they called Bozizé to surrender. "A battle of Bangui is not necessary," said Eric Massi of Seleka. "Namely Bozizé has already lost." Eric Massi is the son of an opposition leader who some years ago was kidnapped and killed by the security forces Bozizé. Massi and a large group of other rebel leaders have many accounts to settle. Since independence from France in 1960, the republic has a history of dictators, corruption and rebels. In November it was rumored that some rebel leaders to join hands to strike. Since then they have almost without a struggle, one after the other occupied city. The poorly equipped troops Bozizé are demotivated. Whenever they left the battlefield even before a shot was fired. They would also have sold ammunition to rebel because they are poorly paid. On a central square in Bangui called President Bozizé why earlier this week the help of former colonizer France. The 56-year-old president, who in 2003 by a coup came to power, looks on its own no chance to stop the rebels. But the French president Hollande has ruled that the French Bozizé going to help. "The time we interfere in internal affairs of these countries is over," said Hollande. The reluctance of the French, who used to be common interventions in former colonies, was already deployed under President Sarkozy. Hollande called for a dialogue, but that is not successful in recent years in the Central African Republic. From 2006 to 2011, there is lengthy negotiations between rival rebel groups, political organizations and civic movements. President Bozizé would all ethnic groups in the country with equal opportunities. According Seleka is Bozizé that promise and other agreements in the peace agreement of 2008 never fulfilled. The current offensive is under the advancing rebels the only possibility to their ideals. The advance of the rebels caused a refugee problem. '' Thousands of people have abandoned their villages and towns. Some car is only a few hours each day in the city, then they retreat in nature, "said a spokesman for the Red Cross. 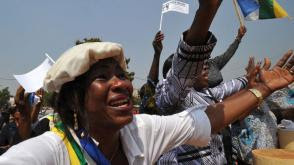 The United States and the United Nations have their people in the Central African Republic summoned to leave the country. Also, many organizations are already pulling back so the situation for refugees only seems to be worse.